Another day on Whole30. 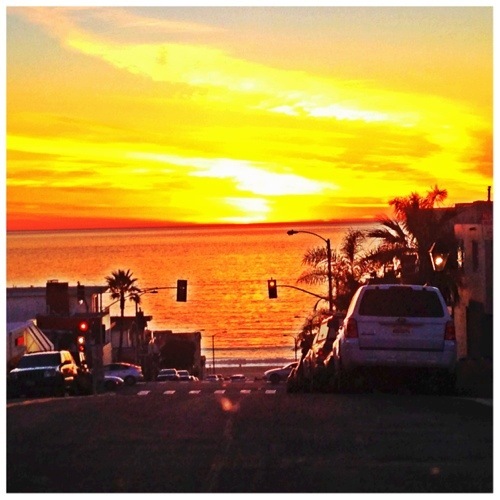 Another beautiful sunset in Manhattan Beach. ABP is one of my life mottos. I believe it can be applied to almost 90% of the situations you find yourself in. My morning started with the first of my weekend prep. I woke up early and put 4 chicken thighs and 3 sweet potatoes in the oven. All before 7:30am. YUP. That’s what I call planning. Why did I do this? So I can have easy to access, Whole30 approved food handy when I am on road and traveling. Once the chicken and sweet potatoes were cooked I put them in the fridge and headed to work. For breakfast I had 2 hard boiled eggs and a green veggie juice. A standard “quick” breakfast for me when I’m on the go. I should also add that while I was at the gym getting lunch, I was offered a shot of Tequila. Yes, Tequila. The gym restaurant serves alcohol and has a full bar because there are a lot of people who work in the office buildings across the street (like myself) and come there. There were several guys in line next to me and they were ordering shots of tequila. They were ordering and turned to me and said “And she wants a shot of tequila, too! Give her a shot!” I started laughing and I said “No, thank you. I can’t drink tequila during the day.” And they kept pushing me but i politely declined. It was actually a pretty funny situation. I mean, who orders tequila at a gym bar? Crazy! I also brought home these SeaSnax Seaweed Packs that I bought off Amazon and had sent to me. Most seaweed packs have canola oil which is not good on Whole30 but these ones are made with Olive Oil and therefore they are whole30 approved. Plus they are salty and good and an easy snack to eat. The Whole30 plan recommends you get enough iodine in your diet and seaweed can help to provide that. Then I headed to the local juicery and picked up several green juices for the road. 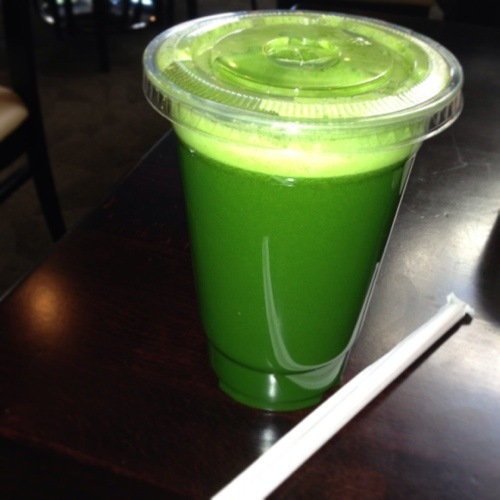 I like drinking veggie juice because it’s easy for me to get my veggies in a pinch. I know people have varied opinions on this on Whole30, but I am a juicing fan. It works for me. I get pure veggie juice with no added sugars. After the juicery I headed home to pack up my Whole30 compliant road trip food and get the car ready for Mammoth. As I drove home I witnessed the most incredible sunset (the one pictured above). Gosh, I love where we live! I packed up our cooler with all of our Whole30 approved food and included ice packs to keep everything nice and cold for the 300 mile drive. We hit the road and my first Whole30 challenge appeared. I was starving for dinner and planned ahead to stop at Sharky’s Woodfired Mexican Grill. I am a huge fan of theirs and knew I could get their protein power plate and still stay Whole30 Compliant. I ordered the Power Plate which came with Chicken, Steamed Broccoli, and Yams. Look delicious? It was. I do have to admit that I had a craving for their tortilla chips when I was there but I abstained. And I felt totally satisfied and happy with my good choices! The second challenge came when we hit our normal pit stop in Lone Pine, CA. My husband and I like to break up the drive by stopping here. But I knew for sure there would be nothing Whole30 compliant at this stop so we chose to keep on driving. Makes it easier to make good decisions when you don’t put yourself in those situations in the first place! We arrived in Mammoth a little before midnight and unpacked our food. More to come on our weekend in Mammoth in my Day 13 and Day 14 Recap, which will be up shortly. Enjoy! What about you? Do you believe preparation is key to a successful Whole30? How do you stay on a healthy eating plan while traveling? Post in the comments and let me know! I always pack food when I travel. Apples, almonds, granola bars or trail mix, etc. I’ve even packed containers of roasted butternut squash! I save cottage cheese containers and then use those for on-the-go food (especially when flying somewhere) and then can just dispose of them on the road. That sun is beautiful…wind chill is something like -20 today so I appreciate the warm photo! Gotta love Sharkeys! So easy to get something safe on the road. Lone Pine? Not so much. Haha, no kidding. There’s a McDonald’s, Pizza Factory, and Mt Whitney Cafe. And that’s about it! Good to know that Sharkeys is Whole 30 compliant! Have a fun trip!